Newest stop of ESL One professional league is going to be at Brooklyn Barclays Center in New York. It is going to be, by far, the biggest eSports events ever held in the big apple. Lots of fans from all around the world are looking forward to it. With CS: GO becoming more popular with each tournament, as a video game and as an online CS:GO betting market as well, this is coming as no surprise. The main event is, of course, formatted into a single group consisting of all 8 teams that will be competing. 6 of those teams are already known – all of which have acquired a spot in the main event with an official invite from ESL. The other 2 teams (that are still to be decided in the upcoming weeks) will have to earn their spots through North American and European qualifiers which are going to be held in the upcoming weeks. Format: GSL Groups + Single Elimination Bracket played in a BO3 manner. The best 4 teams will be playing in the playoffs. What is there to say about betting at this point in time? Well, considering the fact that there is still another month to go until the tournament officially starts (there are few more tournaments starting before it), it is no surprise that not a single online esports betting site out there has released betting information related to ESL One New York 2016. As time goes by and as we are moving closer and closer to the start of the tournament, this information will be added. We will update this article accordingly, so do not worry about that. Bet365 has added starting matches into their respective markets. As you can see, Virtus.Pro has been given a small advantage over Fnatic as well as G2 against Astralis. 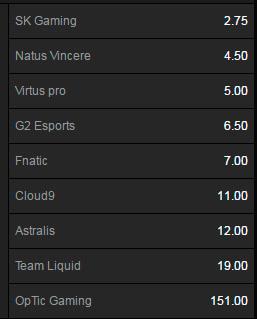 On the other hand, Na' Vi are coming in as clear favorites against Team Liquid with just 1.25 on their win. Betway has also released their odds for ESL One New York 2016. In addition to regular match winner bets, Betway features tournament winner bets as well. The main tournament will start on 1st October and will end one day after that – 2nd October. The first round of group matches will be played on 30th of September after which the main event will start. As is always the case with ESL One events, this one will also consist of a single group featuring all teams. The first rounds are scheduled to be played in best of one fashion while the rest of them are going in as best of three matchups.